After years of work and placing pressure on Congress to act, the National Taxpayer Advocate Service has formally adopted a Taxpayer Bill of Rights. Ideal Tax Solution, LLC has learned that the IRS has formally adopted a Taxpayer Bill of Rights (TBOR) on June 10, 2014, which for several years now has been a top priority for Nancy Olson, Taxpayer Advocate for the National Taxpayer Advocate Service. The TBOR combines many of the existing taxpayer rights allowed under the United States Tax Code and groups them into ten distinct categories, modeled after the U.S. Constitution’s Bill of Rights. This grouping is meant to simplify the core of taxpayer rights and make them easier to understand by individual taxpayers. The Taxpayer Advocate Service is an independent office within the Internal Revenue Service, and under the supervision of the Taxpayer Advocate it is tasked with assisting taxpayers in resolving their tax problems and providing tax debt relief. The IRS first proposed a TBOR back in 2007’s Annual Congressional Report and has urged Congress to adopt the measure for the past several years. Most taxpayers are either unaware or confused about what rights they are entitled to as a taxpaying citizen. By grouping these rights into a single, broad document, the TBOR aims to provide taxpayers with confidence in the integrity and fairness of the system, while hoping to promote better compliance to the tax code. While these rights may seem fairly simple and straight forward as presented, the underlying technical details for these rights can be rather complicated. Each of the TBOR’s 10 defined rights contains three or four descriptive points. Each point is laid out in generic terms as to how a taxpayer deserves to be treated or as to what type of treatment they can expect from the Internal Revenue Service. The points are referenced in the Internal Revenue Code, and the qualifications for enforcing these rights vary from case to case. Ideal Tax Solution (idealtaxsolution.com) has reviewed the Bill of Rights and our team of Enrolled Agents and Tax Attorneys have studied the benefits that these rights were designed to provide to individual taxpayers and businesses. Our tax laws are complicated, and each right corresponds with an underlying section of the law that must be followed. So while inherent rights are terrific for any society, they are unfortunately almost always backed up by laws designed to determine how and when they are applied. Our legal staff continually educates themselves on the hundreds of changes made to the tax code each year. With the passage and implementation of the Taxpayer’s Bill of Rights, our team has evaluated each and every specified right to determine how to best apply it to our clients’ IRS situation in providing the best protection against an IRS audit or debt collection. As current laws are revised and new laws are created, we will continue to lead by remaining on the cutting edge of knowledge and understanding of U.S. tax law and the defense of taxpayer’s rights. Ideal Tax Solution, LLC is located in Costa Mesa, CA, and is a professional collection defense company representing businesses and individuals nationwide, providing tax consultation and tax resolution services. Their Tax Attorneys, IRS Enrolled Agents, CPA’s, and Senior Tax Consultants have over fifty-five years of combined experience working to help American taxpayers resolve their problems with the IRS and State Tax Agencies. 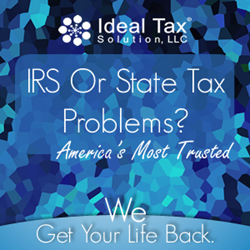 For more information on Ideal Tax Solution, please call 1-888-532-0317 or visit online at http://www.idealtaxsolution.com.